CROSSWIND comes in 700C clincher rim style. The 650C models will follow after we gain experience with the most current design. We will continue to post additional technical information on specific products as shipping progresses. The aerodynamic properties of clincher CROSSWIND is almost identical to its tubular counterparts This is because they have been designed to share an identical exterior form. The primary aero differences are created by the differences in the tires available. The rim weight penalty of clincher style rim is 60 grams per wheel. The inertial differences reflect an approximate rim weight increase (~8% for the wheel, ~20 for the tire and wheel combination). This is the smallest weight penalty ever achieved by a clincher composite wheel. The strength and lateral stiffness of the clincher model exceeds its tubular counterparts (stiffness by ~20% and radial strength by ~15%). The aerospace aluminum alloy tire bead interface is 20 mm wide at the braking surface. The braking surface is 12.2 mm deep. This rim width is narrower than many clinchers to maintain the narrow aerodynamic wheel frontal area of the CROSSWIND. This frontal area and critical shapes in these wheel designs create the lowest available clincher aero drag numbers (see CROSSWIND). The rim accommodates tires 20 to 32 mm wide. 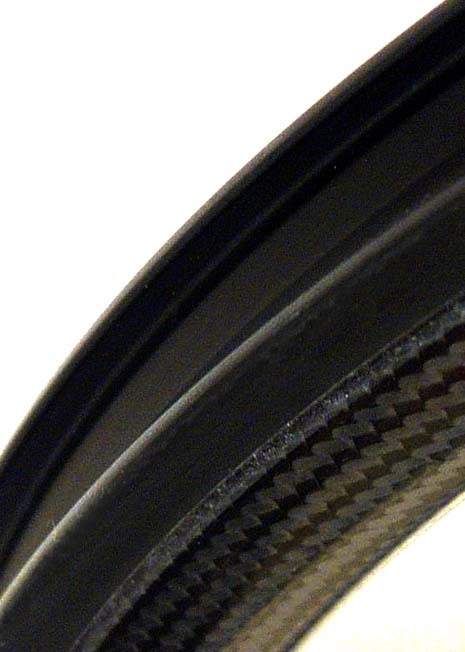 The CROSSWIND clincher rim does not require a rim strip. Note the most current design has a silver aluminum tire interface. Ideal tire pressure is between 90 and 130 PSI. See tire pressure instruction to learn more about tire performance characteristics. 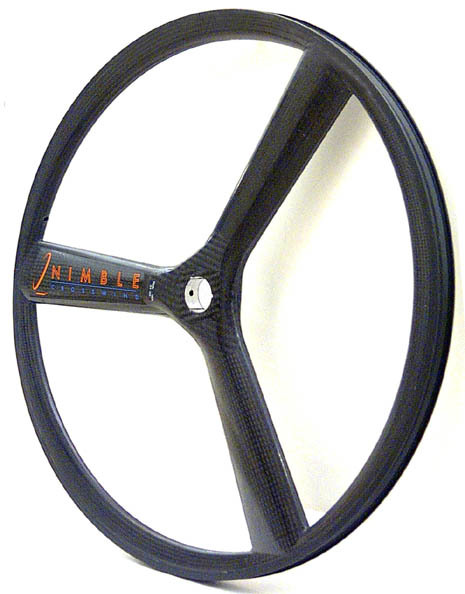 NIMBLE CLINCHER MODEL COMPOSITE WHEELS HAVE A 130 PSI (9 BAR) INFLATION LIMIT. Prolonged (5+ minutes) braking is typically associated with mountainous terrain, high speed descending or heavier riders and bicycles (recumbents, loaded bikes, Clydesdale riders and tandems). These are conditions that convert to high energy braking and demand specialty brakes and rims. High energy braking creates unusually high rim temperatures and is not recommended for our clincher composite wheels (CROSSWIND). Riding in high mountains, riding with loaded packs or any other conditions that create prolonged rim braking can result in over-heated rims. Over heated rims (150 degrees F - too hot to touch with your unprotected hand) can cause the metal and composite wheel joint to degrade or fail. If you expect prolonged braking, you should not ride our clincher composite wheel. We also advise against the use of any competitor's products that are made of combined metal and composite materials. As alternatives, consider our single metal material Spider clincher wheels, or our all composite CROSSWIND and FLY tubular rims. CLINCHER MODEL COMPOSITE WHEELS ARE NOT FOR MOUNTAINOUS OR PROLONGED BRAKING CONDITIONS.